1. Transfer the drawing and ink in the contour lines. I seal the drawing with a thin coat of umber and medium. (imprimatura) And allow it to dry for several days. 2. Using my study in charcoal as reference and direct observation. I start the (grisaille) under painting. I model the forms in values with a mixture of raw umber- ultramarine - and flake white. 3. The goal is to describe light and shadow, paying close attention to halftones, that area where shadow meets light. Here is the finished grisaille before the color layer. It appears a bit darker I believe because the mid-tone glaze (velaturas) was not completely dry. That layer brings a soft focus to everything kind of as if in a fog. This is a early shot of the beginning of the color stage. I'll post more on it as it develops. I have been diligently photographing the painting stages as the work develops, so that the finale of this project will be a video tutorial of the entire process. I have gained a new appreciation for stop motion animation, and can not imagine how someone like Ray Harryhausen made hours of movies this way. 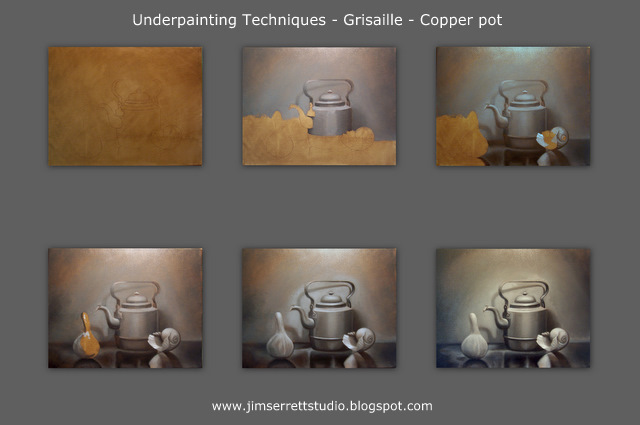 You can find more information on underpainting techniques by looking under "labels" in the side bar. Enjoying your informative post. Merry Christmas.